A cylindrical container of height 14 m and base diameter 12 m contains oil. This oil is to be transferred to one cylindrical can, one conical can and a spherical can. The base radius of all the containers is same. 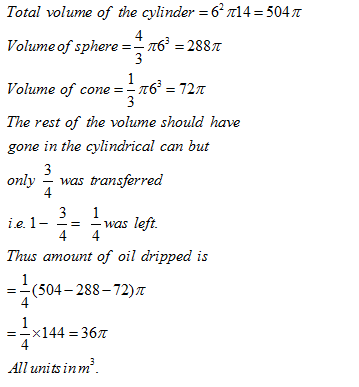 The height of the conical can is 6 m. While pouring some oil is dropped and hence only 3/4m of cylindrical can could be filled. How much oil is dropped? The length of a rectangle is increased to 3/2 times of its length and breadth is reduced to 1/ 3rd of its breadth. What is the change in area? Hence the new area is half of the original area. Correct option is (c). Let the side of the cube is '2x' units, so its volume is 8x3. Now if the sphere fits inside the cube, then the diameter of the sphere will be same as the side of the cube. Area of new rectangle = 1.05 X .94 = 0.987. The circumference of a circle is equal to the side of a square whose area measures 407044 sq. cms. What is the area of the circle?